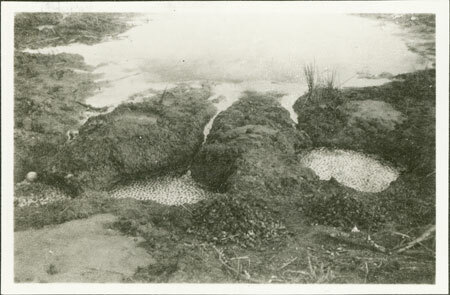 A series of pools studded with the hoofmarks of cattle, probably in the bed of a dry season river channel. Such pools were often excavated in the holes of river channels to provide water sources for cattle and people during the drought. An image showing a dry season forest pool from the same film was published suggesting a location in Lou country. Note on print reverse ms pencil - "32/7 37 70 "
Morton, Chris. "Pools in Nuerland" Southern Sudan Project (in development). 03 Jan. 2006. Pitt Rivers Museum. <http://southernsudan.prm.ox.ac.uk/details/1998.346.70.2/>.